We've been following this saga way too long but huge credit to Richard Harris and Bo Links for nearly a decade of battling to save Alister MacKenzie's Sharp Park design. After essentially facing the same foe--Brent Plater of Wild Equity--the San Francisco Board of Supervisors finally included the course as part of a natural resources plan that will ensure its long term prospects. A WPA project designed by MacKenzie and Pebble Beach remodeler Chandler Egan, the run-down public course still sports a vibrant and diverse golf scene. With some love and money, it could be one of America's best public golf facilities. The full press release announcing what appears to be the (merciful) end to this saga. SAN FRANCISCO, CA – After eight years of non-stop political battles, efforts to preserve the historic Sharp Park Golf Course have received a long-term commitment from the San Francisco Board of Supervisors. · Allowed modification of three holes along the margins of Laguna Salada, a freshwater marsh in the center of the course, to enhance habitat for the endangered San Francisco garter snake and the protected California red-legged frog, on condition that the changes be consistent with the golf course’s historic architectural character. The California Coastal Conservancy and several resources agency and court decisions noted that construction of the golf course in the early 1930’s severed connection between the Pacific Ocean and Laguna Salada, thereby converting what had been a brackish marsh into suitable habitat for the freshwater frogs and snakes, which were first found at Sharp Park in 1946, 14 years after the course was opened. 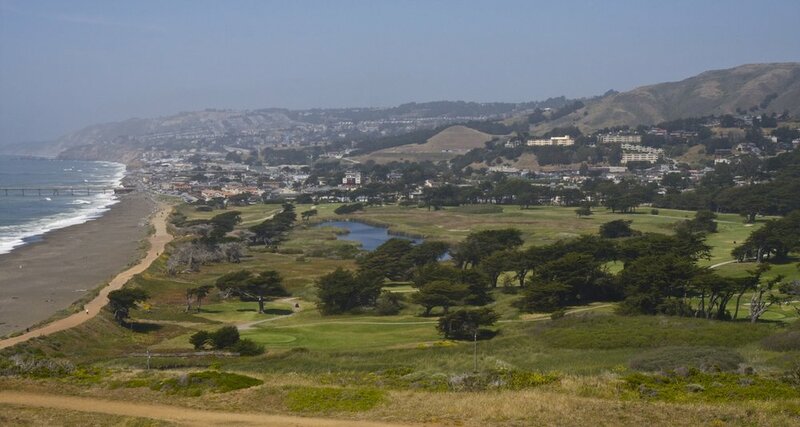 In a 2015 decision in favor of San Francisco’s Sharp Park plans, the Coastal Commission emphasized the importance of balancing the historic public recreation value of the golf course with the need to protect endangered species. At that point, 50-plus San Francisco Public Golf Alliance members who came to City Hall to testify – working men and women, retirees, and students from across San Francisco’s broad ethnic and social spectrum – happily went home. During the two weeks before the hearing, the golfers submitted over 1,000 e-mails and mostly-hand-signed letters, pleading the case for their beloved Sharp Park. Thanks to the Supervisors’ vote, neither the irony nor the golf course will be lost. "Brighter days await MacKenzie-designed Sharp Park Golf Course"
Brad Klein says better days are ahead for Alister MacKenzie's Sharp Park, a much-needed municipal course in a grand setting that is now essentially the target of one environmentalist. Multiple court decisions have gone against that figure, setting the stage for property and golf improvements to take place that will not only make Sharp Park critter-friendly but also golfer-friendly. Richard Harris, who with fellow attorney Bo Links is co-founder of the S.F. Public Golf Alliance, reports that architecturally detailed restoration plans “are now being developed by Tom Doak, in collaboration with Jay Blasi.” Preliminary construction estimates for the work, involving greens, tees and bunkers, are in the $8 million range, plus soft costs for permitting, and likely would take 3-4 years to complete. Work on the project is being funded through a partnership of the S.F. Public Golf Alliance and the privately funded Alister MacKenzie Foundation. Someday there will be a medal of some kind for Richard Harris, Bo Links and everyone else who has fought to save Alister MacKenzie's Sharp Park and maybe even see it restored some day. The evidence is in the latest Hail Mary attempt by the one-man band left trying to stop a restoration of wetlands and someday, the course. Wild Equity, a small environmental litigation firm founded by a former staff attorney of the Tucson-based Center for Biological Diversity, brought the lawsuit to stop San Francisco from installing concrete pier footings and a retaining wall at a pump house at the southwestern corner of the golf course. The concrete work was only a small portion of a dredging and pond-building permit approved in April by the Coastal Commission. The project is intended to improve the habitat for protected frog and snake species at the golf course, while reducing flooding risk to the golf course and a neighboring residential development. Wild Equity’s lawsuit named the Coastal Commission and San Francisco as defendants; the San Francisco Public Golf Alliance joined the lawsuit as an intervening defendant, to represent the interests of the public course golfers and historic preservationists who treasure the venerable golf links. This is the fourth time in recent years that the courts have rejected environmentalist groups’ challenges to operations at Sharp Park Golf Course. The United States District Court, Northern District of California in 2012, and the Ninth U.S. Circuit Court of Appeals and San Francisco Superior Court in 2015 all dismissed prior law suits. Lawyers at San Francisco-based Morrison Foerster have represented the Intervener San Francisco Public Golf Alliance, on a pro bono basis, in all the lawsuits. Sharp Park Wins Approval For Projects, Lawsuit To Follow? "It now opens the door for restoration plans to move forward in earnest, including the restoration of Mackenzie features on the course"
I missed Golf Central's story on the Sharp Park issue. Very nicely done by Rich Lerner and the production team to talk to all of the parties involved. But look at the intimidating presence the drummer and flutist had as over 300 golfers appeared for a double-shotgun fundraiser to save the Pacifica muni designed by Alister MacKenzie. Sharp Park Parking Lot Showdown?! Enviros Plan To Protest SF Public Golf Fundraiser! "Sharp Park Granted Stay, Postponing Lawsuit"
The S.F. Chronicle's City Insider Blog explains the Mayor's reasoning for vetoing legislation that likely would have ended future golf at Alister MacKenzie's Sharp Park. 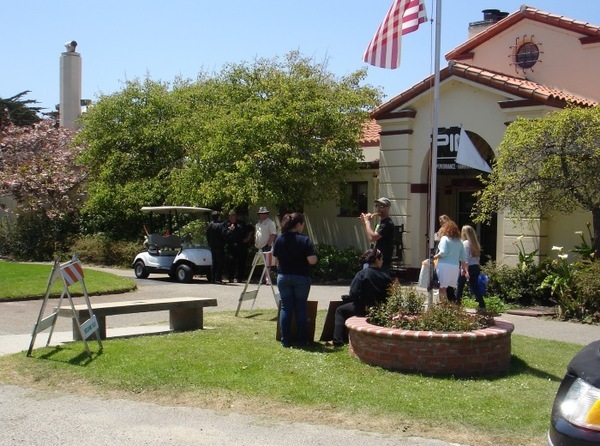 USGA Sticks Up For Sharp Park! Praise Joe Dey! Holy P.J. Boatwright! "It would be a tragedy...if San Francisco were to host one of the world's two most important golf tournaments, while being in the process of destroying Alister Mackenzie's legacy just 10 miles away." Bill Fields explains where Sharp Park stands after a Board of Supervisors vote heads to Mayor Lee's desk, and also reveals parts of an impressive letter sent by Ken Venturi. When considering a veto, Lee will have all that background at his disposal. Plus these words from Venturi, the most famous golfer to come out of a Bay Area muny, who in his letter to Lee, reminded him about the 2012 U.S. Open being held at San Francisco's Olympic Club. "It would be a tragedy -- and a terrible public statement by the City to the international golf world -- if San Francisco were to host one of the world's two most important golf tournaments, while being in the process of destroying Alister Mackenzie's legacy just 10 miles away," Venturi wrote. "Please don't let that happen." Lee's veto, however, wouldn't really be about public relations or being nice to a long-gone architect, however great his legacy. More than anything, it would say common sense hasn't gone out of style. "Golf at Sharp Park Tentative After Supes Pass Avalos Ordinance"
Camden Sweda explains today's possible setback for Alister MacKenzie's Sharp Park, as supervisor John Avalos's bill to help his standing with segments of the environmental community was passed, opening the door for the City of San Francisco to negotiate a handover of Sharp Park to the National Park Service. Bill Fields reports on a reprieve until next July's trial on the future of Sharp Park. With the Presidents Cup past I finally got to savor Bill Fields' gallery of black and white images from a recent visit to the embattled Alister MacKenzie public course outside San Francisco. It's well worth a look and a reminder of just the kind of place golf needs more of, and yet, the effort to save the place has not been joined by any of the game's national organizations. I also forgot that the Save Sharp Park folks got their day in court with the Wild Equity zealots on November 18. Fields filed this update on what went on. "Sharp Park is the latest Flanders field between the stereotypes of rich, white, middle-aged golfers and the ponytailed, sandals-and-socks set." A nice twist in the Sharp Park saga: two San Mateo County supervisors penned an op-ed for the SF Examiner advocating saving Alister MacKenzie's embattled public course and say the county would be happy to take on the burden of operating a potentially fantastic, profitable and environmentally important public course. Go figure! However, Sharp Park does not have to become the philosophical moonscape of trench warfare, where slogans and sound bites obfuscate reasoning. Sharp Park can be a place where golfers from all socioeconomic strata successfully co-exist with sensitive coastal species. Actually, San Mateo County and Pacifica already have the framework of a plan to do exactly that. The golf course can be reconfigured to support the endangered snakes and threatened frogs, while recapturing some of MacKenzie’s original layouts. Additionally, San Mateo County has already identified private sources willing to underwrite most — if not all — of this proposed peaceful co-existence. This is good news for golfers and ultimately, the entire facility and environment as the desperation move by the extremists at the Center For Biological Diversity speaks to the state of their case to get the Alister MacKenzie course shut down.